The mighty Mukamuka River trickles through the lower parts of its catchment. It’s Friday evening, and seven of us arrived at Catchpool Valley carpark at about 6.30pm. 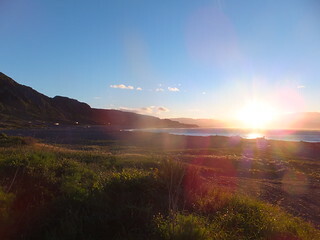 It’s quite a nice change to visit a place so near to Wellington, and getting into summer it’s quite light. 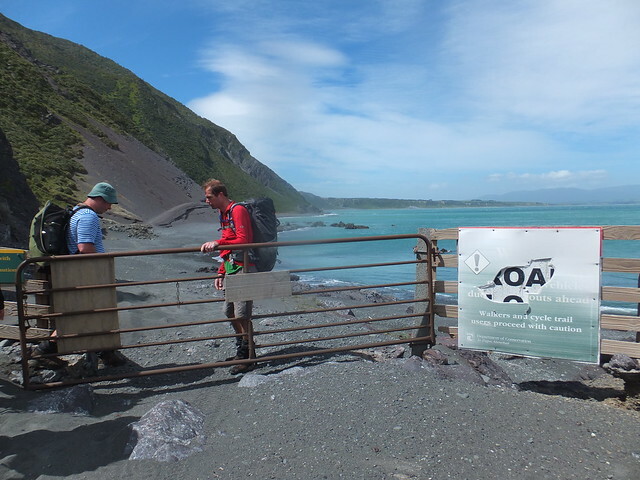 After some brief orientation at the car-park, we’re walking towards the Orongoronga River: destination Paua Hut…. but outside, because nobody’s bothered to collect a key. Conditions are calm, but from the forecast I’m anticipating rain. Planned route: In to Paua Hut for Friday Night, nav up to .797, then 1km NE to sidle across slip and SSE down ridge to west of Mukamuka, over .385 and down to confluence. 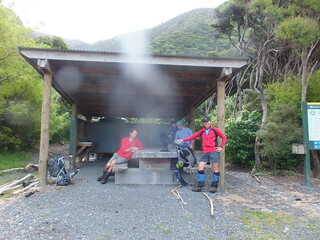 Out to coast via Mukamuka, turn east and Corner Creek Campsite for Saturday night. 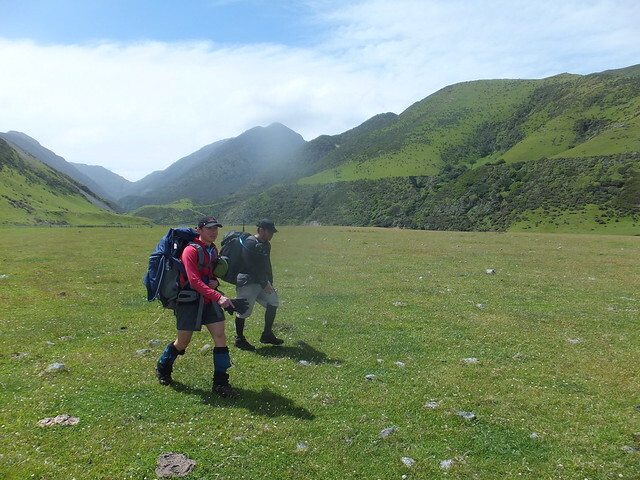 Out via Mukamuka and South Saddle, main route to Orongorongo River and Catchpool Valley carpark on Sunday. Actual route: From Paua Hut up to .843, then 800m NE and down scree gut into Tapokopoko Stream, then to confluence with Mukamuka. Also see: Alistair wrote a trip report for the WTMC newsletter. Dan and WeiMin on Friday night. 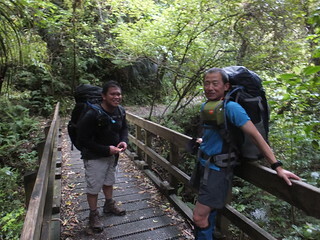 We reach the Turere Bridge at about 7.50pm, then continue south-west along the main river bed in low flow to reach Paua Hut, looking for places to fly-camp outside. I hate trying to identify good places for fly-camping, but Dan and I eventually settle on a spot further down from the hut in the trees. In the end we have three 2-person flies, while Mister X sets up a tent some distance away. It was soon dark, and with nothing much to do we drift off to sleep, listening to nearby Moreporks hooting. I’m anticipating rain to begin, and not really stop until midday Saturday, but that never happens. Instead there were some big gusts of wind overnight, showering leaves on the fly, but the structure itself barely rippled. It turns out not everyone’s been so lucky, though. Apparently the other guys have been up fixing tent pegs all night. I guess we got lucky…. I don’t even think ours was pitched very well. We’d been planning to get away by around 8am, which for me would normally mean being up by about 7, but Alistair came by and woke us an hour earlier than that, maybe encouraged by the wind. Breakfast’s normal, it’s definitely not raining (I still think it’ll start), and we discuss plans for the day. Getting ready to leave Paua Hut. 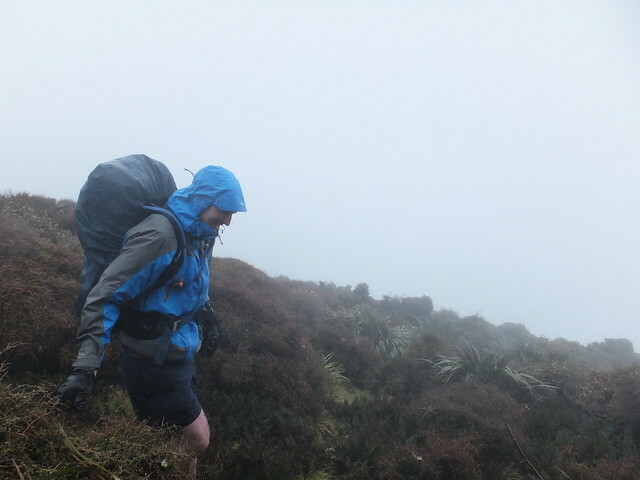 As the wind’s picked up, and as Dan and Bernie and possibly Mister X are fairly new to this type of thing, Alistair’s proposing that we should consider avoiding the original plan of climbing to .797. It would have involved traversing a narrow slice of ridge, with some bluffs, north-east of that point. Normally this would be fine, but it might not be so good in high winds. 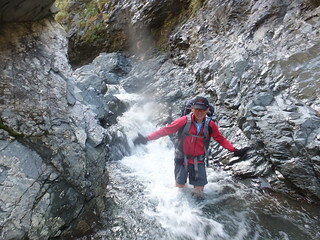 Instead, we’d head roughly south up Paua Ridge, then across and down a nice scree gut into the Tapokopoko Stream, eventually reaching the same confluence with the Mukamuka River. WeiMin and I argue over compass bearings, but soon work out that it’s actually just (yet another) argument over use of red in the shed. He’s in the misguided and confused team of people who feel the need to add and subtract, whereas I’m in the superior and awesome team of those who just leave red on 22, or nearby. Dan and Alistair, at about 490 metres. I set my compass bearing, WeiMin sets his distorted compass bearing, and we’re finally away just after 7am. Within a minute of leaving on the bearing, we’re already passing taped route markers up Paua Ridge. Further towards the top remain a collection of markers which Alistair nailed up about 20 years ago. Supposedly, he declares, because he anticipated that far in advance that we’d be wanting to come up here today. They’re weathered, and several of the trees are fallen, but they’re still in good shape. Congratulations. You’ve reached peak .843! We reach spot-height .843 at 9.50am. 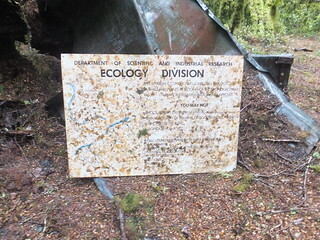 it’s marked by an ancient, weathered sign from the Ecology Division of the long-ago-disassembled DSIR. We stop to regroup, and consider things, on the far side of .843 for a few minutes, then head NE on a bearing. Once again, we’re soon following another mixture of markers, emerging into some chest-high thick dracophyllum-and-friends type scrub. 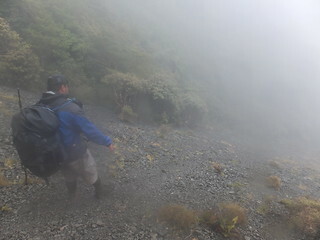 Now being on exposed, we’re suddendly hit by strong and constant wind as it pushes over the top of the ridge. For a while it’s tricky to reliably stand. Bernie drops towards the scree gut. 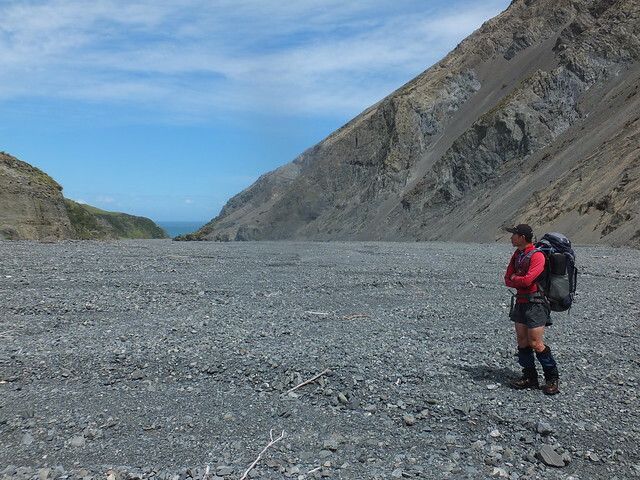 After about 20 minutes of fighting with scrub and wind, we veer off to the Wairarapa side, improvising a route of slips and drops and clambers that eventually deposits us into top of scree slope. Finally being out of the wind, we can take turns skidding down the scree, which widens into a massive gut as we drop further down. It’s slow-going at first, with seven of us to go one at a time on what’s initially quite narrow, but after a couple of episodes it becomes easy to spread out sideways more, reducing the hazard for anyone below. The gut eventually closes in. 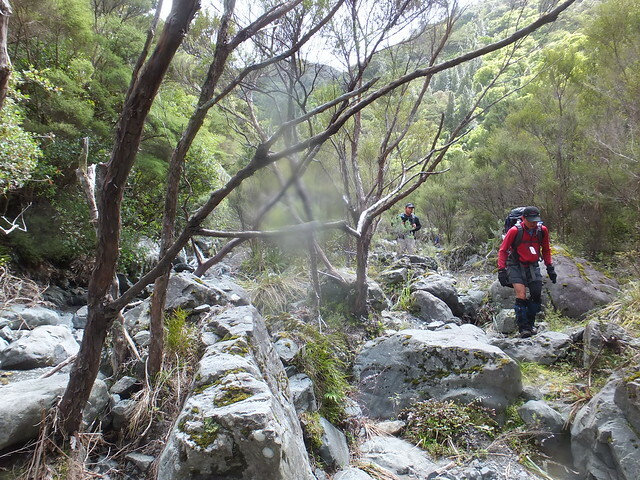 With water having emerged from the ground and an un-mapped creek now flowing down the gut, we have to cease at about 11.30am and consider how to get past a difficult waterfall. Mister X checks out the most obviously direct way, but Alistair’s been here before and reckons the optimal thing is to back up and sidle above the true right. With a couple of false starts, we back up a short way and find a sidling route. Maarten calls out to Mister X, agreeing to meet him back in the main stream further down. It’s not a pleasent sidle, but it does the job. I propose that we don’t come back this way. 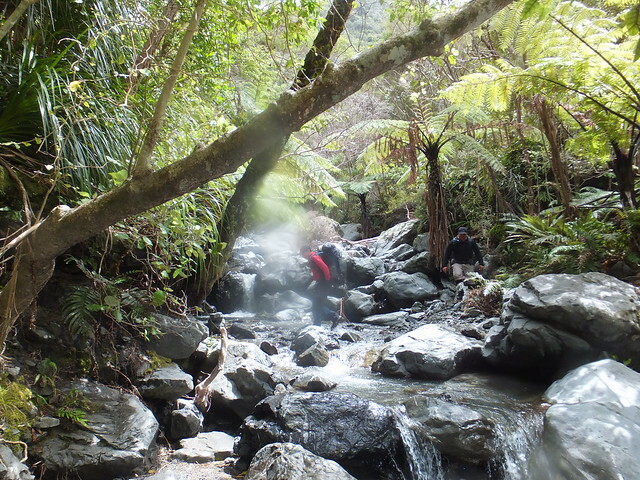 By 12.10pm we slip back into the gut, and 20 minutes after we reach the main Tapokopoko Stream. Mister X isn’t here, even though we’ve definitely seen footprints. Maybe he assumed that Maarten meant the main Mukumuku river, much further down. Hopefully, at least. We stop for lunch, assuming we’ll catch him later. 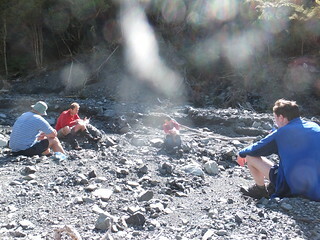 This valley is littered with recurring Ongaonga, and within the space of an hour, I think all six of us have managed to grab a handful or a knee-full of stings. After lunch, and with the sun coming out in this sheltered gorge, we have a relaxed, casual walk alongside and through the Tapokopoko. We’re still following Mister X’s footprints, and hopefully he’s waiting not far along, maybe at the main confluence with the Mukamuka River. Meanwhile, this is a very nice valley and I’m quickly developing a greater respect for the Rimutaka Range. There’s one small hiccup near the confluence with the Mukamuka, where a small waterfall flows into a small gorge. It could be climbed around on the true left or alternatively was waist-deep last time Alistair had visited. When Bernie slid in, though, it’s only about knee-deep, so we’re thinking that recent clean-outs of the catchment must have left that section filled up with shingle. Ten minutes further, after some delightful scenes, the Tapokopoko enters the confluence and suddenly we’re walking through a vast, wide river-formed valley. We’re finally back on the route of our original plan, which would have seen us drop down from the spur which separates the two rivers. Wow, we can see straight out to the Wairarapa coast from here. It’s also windy, and increasingly so as we approach the coast! Mister X isn’t waiting here, which is mildly worrying. 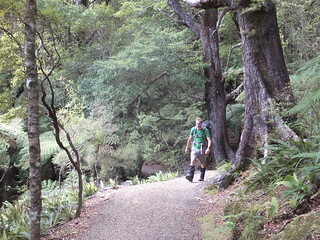 As we walk out towards the coast, passing a giant erosion gully on the true right, we see more of his footprints. Apparently he’s still gone on ahead, to the campsite or somewhere along there. This wasn’t part of the arrangement, but at least we didn’t leave him back in that scree gut with the waterfall. WeiMin stands in the Mukamuka valley, with the Wairarapa coast in the background. Nearer to the coast, the wind picks up hugely. It’s about 2.30pm as we climb up onto farm-land beside the river. Passing a dead cow we head to the left, north-eastwards and onto the 4WD road around the coast, towards DOC’s Corner Creek Campsite. A couple of kids ride past on motorbikes. We don’t see any more footprints, but he could have gone along the road above the beach, which is where Alistair’s chosen to go. With much battling of the corrosive wind and generally being sandblasted on the beach, it’s about an hour later (3.30pm) when we arrive. Suddenly there’s no wind, the sun’s out, and it’s a pleasant and warm day again. 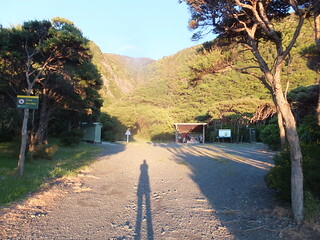 Alas, however, there’s no sign of Mister X at Corner Creek Campsite. The only scenario we can imagine at this point is that he most likely turned the wrong way at the coast. Despite being insanely fit, Mister X doesn’t have much of a reputation for reading a map, or paying much attention to actual plans. It’s really very frustrating, and a great example of why it’s so important to not run away from a group, especially when there’s been no clear arrangement of where you’re going. In reality we’re not too concerned about Mister X at this time. He’s self-sufficient, with his own tent. The coast is a semi-populated place. We figure that if he doesn’t find us, he’ll set up his tent and camp through necessity, if he has an emergency he could probably knock on a door or otherwise find someone to ask for help. One way or another he should find his way out if he doesn’t find us first. If not, I guess it’ll turn into a much bigger thing and that will be annoying for everyone concerned. The shelter at Corner Creek Campsite. Until now I’d been concerned we could be camping in a wind tunnel, but Corner Creek Campsite is mostly sheltered, with just an occasional gust of wind sneaking in somehow. Alistair and Bernie find a campsite. Maarten and WeiMin find a campsite. I look around for a while, but there’s nothing that’s “perfect”. With nobody else around, I manage to convince Dan that (while we can put up the fly somewhere if he wants it), we should just set up in the shelter—part of my salute to my preference for sleeping on hut balconies. If someone else turns up, we have a backup plan of pitching a fly so as not to be in the way. The sun’s out and wide-eyed, so it’s a great afternoon to laze around, as long as we’re sheltered from the wind. 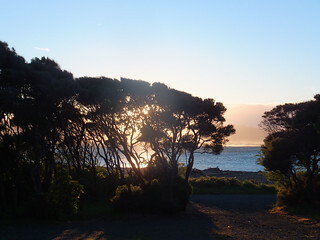 It’s uncharacteristic for a typical weekend tramp to have a Saturday evening in a place like this, which is remote but not so remote, and also which is next to the sea and with a fab view across to the Aorangi Range. Alistair heads over to the beach to lie down and sleep. Dan, Bernie and Maarten find pockets of sunshine around the grass. I find some cash and a pen in my pack, and dutifully fill out the form to pay $6 for the campsite. It doesn’t fit into the box very nicely, and I wonder how frequently people come by just to slide their fingers through the slot to pull out cash-filled envelopes. It’s annoying how Backcountry Hut Passes aren’t valid at these things. A man and woman drive past the end of the campsite in a ute, who WeiMin ends up talking to. I wander up and we mention the whole thing about Mister X being [cough] elsewhere. Maybe they’ll let him know where we are if they spot him. This is awkward. But hey, he’s self-sufficient. We’ll become concerned if we still haven’t heard anything by the time we’re out and with cellphone reception. Dinner is a tasty variant of pasta blah, with some sauce that Alistair mixed up before he left. We count up the pasta and fortunately have enough. Mister X’s portion was only enough pasta for himself. His other big food contribution was to be the ginger cake part of dessert. Instead, we’ll just be drinking the custard without it. And it works well. As we eat and chat, I keep finding myself looking towards the coast to see if Mister X is finally arriving, having decided to turn around and go the other way. No such event occurs. Nobody else besides us visits the campsite, so as the sun disappears, Dan and I unpack sleeping gear and get set up in the shelter. Despite the high wind in the upper atmosphere, the sky’s still clear. From where I am, with a limited view of the night sky over the horizon, I spot at least three meteors before I drift off. These sandflies are annoying. We expect Sunday to be a very cruisy day, especially compared with Saturday. There’s no serious off-track in our plan. 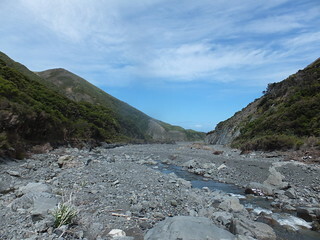 We’ll walk back around the coast to the mouth of the Mukamuka, up the river (but without veering up the Tapokopoko where we came down), and over South Saddle to Matthews Stream and the Orongorongo River before heading out. The aim is to be away by about 8am. For me this would normally mean a roughly 7am rising, but everyone, including myself, is already stirring with the sunrise. It’s a fabulous sunrise, too. We sit in the shelter eating breakfast as the sun comes up directly out from the main entreance to the campsite, shining straight in soon after 6am. I pull myself up, noticing a series of sandfly bites down each of my shoulders. Great. We’re away and moving at 7.15am, retracing our steps around the coast, and suddenly we once again meet the full force of the wind. There’s been no sign of Mister X overnight or this morning, and we wonder if we’ll encounter him on the way back somewhere, if he’s returned to a place where he knows we’d be going past. Unlike yesterday, nobody bothers to walk on the beach. We stick to the road, partly eroded, and despite the climbs and descents I think it’s much faster than trying to walk with boots and packs on sand. 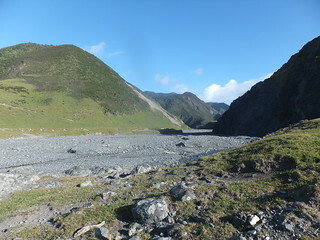 The mouth of the Mukamuka. It’s 8am when we arrive at the mouth of the Mukamuka, to leave the Wairarapa coast behind for our journey inland, back to the Orongoronga Valley. We stick to the farm-land for as long as seems reasonable. It lasts about ten minutes before it looks like we’d get bluffed out above the river. From then on we walk straight up the middle on the main South Saddle route. There’s a further 15 minutes of re-tracing yesterday’s steps to the big confluence of three different rivers. 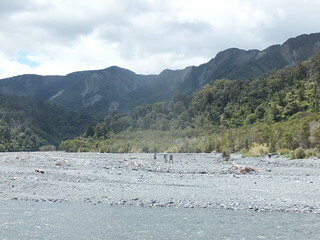 If there were any doubt for the South Saddle route, the Mukamuka’s riverbed is markedgiant by a orange triangle, attached to a pole which stands in the middle. Anyone with the slightest idea of how to read a map would be embarrassed to have a problem here, though. The geography’s that obvious. and Bernie take a break. Dan at about the 370m contour. 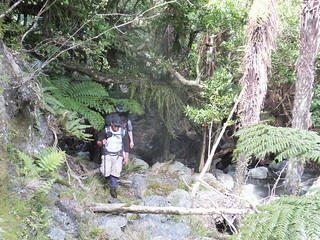 The walk up the Mukamuka is straightforward, especially in the low flow of today. Besides generally enjoying it, I keep myself occupied by trying to track how far along we are, mostly just with a map and compass and observations. It goes quite well. The ascent gets marginally messier at about the 350m contour, when the climbing is steeper, but it’s no worse than basic clambering around low or high branches. The Mukamuka also comes with occasional patches of stinging Ongaonga if you’re unfortunate enough to brush it or get a handful, but there’s nowhere near as much as we encountered in the Tapokopoko catchment. 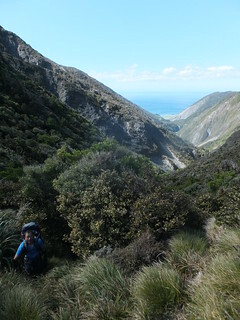 We regroup on South Saddle at about 10.20am, and we’re able to take in some valley-framed views both out to the Wairarapa coast, and in towards the Orongoronga Valley. It’s not as windy as I had expected. From here we had entertained a possibility of navigating a shortcut north-west, more directly down to the Orongoronga River. Apparently there’s an old route in there somewhere, but we can’t immediately see a nice way into that spur. Someone looks to have marked a route up to spot-height .701, though. Maybe the optimal way is to reach that high and then follow a parallel spur down, instead of directly off South Saddle. 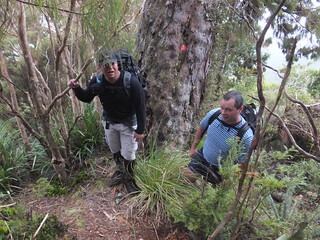 In any case, after sharing around and devouring some sour snakes (which Dan confirms are excellent for when you’re feeling exhausted), we elect to simply follow the main route eastwards and join the main Mt Matthews track. Leaving the saddle at 10.30am, we gradually arrive at Matthews Stream between 50 and 60 minutes later, stopping for a lazy 40 minute lunch in what’s now a scorching sun. From midday we make our way into the main Orongoronga catchment, spend an hour cruising back to the Turere Bridge (dampening someone’s smouldering campfire in the river bed along the way). We finally begin to meet the day-out crowds along our drifty 90 minute walk back to the carpark, including a lengthy stop for a chit-chat at one of the bridges. Maarten in that last bit. It’s was only now that we finally discover a sign of Mister X, finding a discount Homebrand ginger cake pressed to the windscreen of the van. It’s still unclear what was going through his mind, a with a followup text message and phone call, we find that he’d turned right instead of left when the Mukamuka hit the coast. 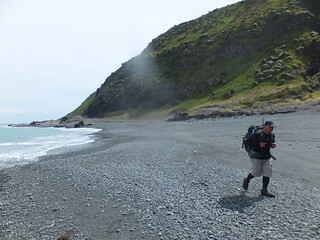 Then he walked 14 kilometres around the coast to the mouth of the Orongaronga River, 12 kilometres up the river to Paua Hut, and a further 6 kilometres back to the Catchpool Valley carpark… and apparently he reached by 6pm on Saturday evening. So, um, yeah. I think we’d have preferred it if he’d stopped and waited after sidling that waterfall, but whatever. Overall it’s been a refreshing weekend. It’s helpful that it didn’t rain too much (or at all), and I was able to see a side fo the Rimutaka Range that I haven’t seen up close before. Heading to the other side of the range is a nice change from the Orongoronga River, which is sprinkled with so many private huts and batches. 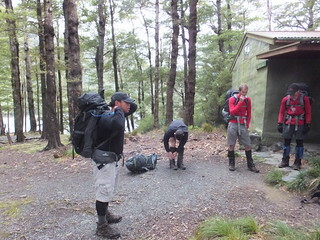 This entry was posted in tramping and tagged navigation, onga onga, rimutakas, screeeeee, tramping, wellington tramping and mountaineering club. Bookmark the permalink. Geez you covered a bit of ground! Beautiful though. Mr.x certainly must be fit but I cant help but profess a certain desire to smack him upside the head upon seeing him again. One of the reasons I prefer to tramp alone. Happy Holidays! Hi Robb. Great to hear from you. And yes, there was some discussion during the time about some things which I’ve portrayed fairly diplomatically here. 🙂 I should also have more clearly indicated that the ginger cake on the windscreen thing was the extent of what he’d been able to do to indicate to us that he’d managed to find his way out, and furthermore he was apologetic with the text message. I think he was trying to be smart, and messed up (in an ultra ultra fit way). There’s really nothing you can do about someone who just chooses to run off for who-knows-what reason. In the end I find that most people accept some mutual responsibility for how they interact with the group, or they wouldn’t have shown up to begin with, and those who don’t quickly develop reputations.